How Can We Improve EVE Community Blog Banters? The EVE Community Blog Banters exist to encourage cross-blog conversation and the sharing of traffic amongst blogging sites. 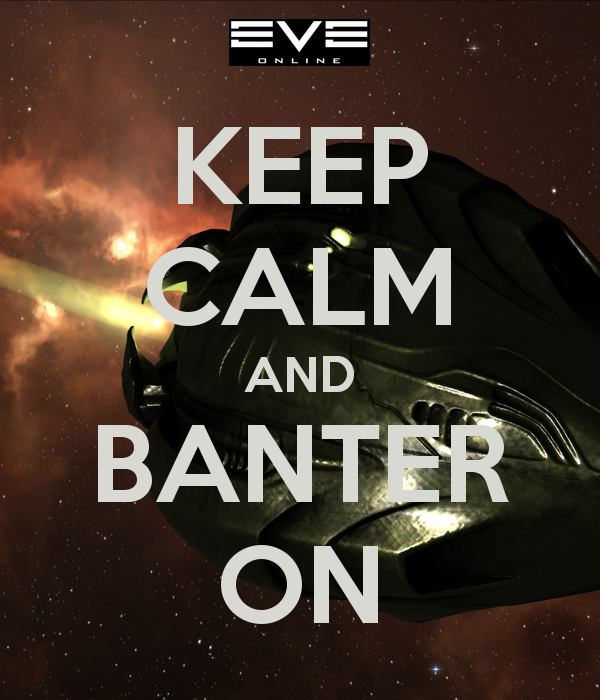 The Banters are also a great way to marshal the resources of the eclectic EVE blogging community for broader projects, such as the currently active Community Review of EVE Online for BB42. It’s been great to rack up another successful and vibrant year for Blog Banters, in which we’ve seen them evolve and improve with the end-of-Banter reviews, which are now entirely written by the most magnificent of community members. Additionally, Banters have enjoyed a healthy relationship with CCP, with devs often suggesting the topics and occasionally even contributing to the conversation. EON Magazine has also recognised the significance of Blog Banters as a community voice. However, it is important to remember the underlying purpose of the Banters. Whilst I find curating the initiative very rewarding, it is not mine to direct. I never lose sight of the fact that Blog Banters belong to the blogging community, I just do the admin and try to prioritise community-sourced themes and focus on topics which are relevant. Since their inception in 2008, Blog Banters have always been a way of keeping the grassroots blogging community connected and they are intended to be inclusive and community driven. They are for you, the blogger, so you should have your say. As such, it’s important that the blogging community guide the initiative. So as we look forward to the sixth year of bantering and bloggification, I’m hoping all you contributors; past, present and future, might let me know how you would like to see the Blog Banter initiative proceed. What works and what doesn’t? What makes you inclined to get involved? What puts you off? How do we keep things fresh and evolving? I’m happy for banters to plod along as they already do, but this is your Banter and any suggestions which would improve your experience are very welcome, so please have your say in the comments below. I think they're basically fine. Sorry I haven't written one yet. Sometimes the topic gets me thinking but by the time I've thought through what I want to say it sometimes feels that maybe I'm too late and there's no point posting one a week after everyone else. Perhaps a cut-off date might be good so procrastinators like me can know whether we should bother. Virto, I don't really want to launch a blog banter about blog banters, that seems a bit over the top. A quiet discussion in one place will be sufficient to get community feedback and keep things on track. Stabs, thanks for the feedback. I certainly don't want to tinker unnecessarily, so if there's a consensus that the system works as is, I'm good with that. I originally relaxed the demand for any stringent deadlines and particular formats because I saw blogging as a fairly relaxed pursuit and didn't see the value in applying unnecessary pressure or control. I've often seen folk saying they don't get involved because they feel they don't write in time. Personally I'd like to get away from the idea that if you don't reply straight away, it's not worth it. I disagree with your statement that "there's no point posting one a week after everyone else". Banters run for roughly a month, and the idea is that a conversation develops with the later entries having the opportunity to reply to earlier ones. So there is very much a point to posting a week later than everyone else. I'd like to move away from the misconception everyone needs to reply at the same time and say the same thing. I'd like to improve the Blog Banters as well…. But I have not a single idea how we could. I've seriously given it thought and I'm honestly not sure how it could be improved. Not that the system is perfect, but its imperfections are its strengths and its importance. It we try to perfect it, we may lose that which makes it work in the first place. Sometimes things work simply because they are the way they are. The BB works because it is simple, relatively easy and there is one person at the heart of it that cares enough to keep it going. And while the BB's roots are important certainly, it has never been as good as it is right now. And you deserve the credit for that my friend. So as long as you are ok with continuing I see no reason to change anything. Except the usual "let's do better" and "work as a team" and "Try to keep it great" stuff we always say at moments like these. Though I'd like to think that anything that can be improved usually can be in some way. Having said that I also have no issue with the current Blog Banter. I think its fine as is. Some the topics really do really take a while to consider, i know it can take me days to ponder the various topics and then attempt to write about it. Assuming I can even attempt to write on the topic at all. If someone comes up with an improvement to it, well that's great or even better as well. I also not sure how exactly it can really be improved for ideas. Someone might in time think of it, but I don't have an answer to improvement that fits. I've only contributed to one BB so far. I've attempted a couple of others but run out of time, mainly in writing it rather than thinking about it. I think the BB's are fine as they are, they provoke a lot of thought. The also provoke a lot of words! That's time again, especially for the summariser. It's mentioned a few times in the other comments. Why not try a concise BB one month? Nothing as draconian as a word limit, maybe a "paragraph or two". For example, "In one paragraph or less sell your favourite thing about EVE to the MMO community" or something similar? I'd have to think more about ideas for a topic that suits. And, add that the cut off date for every banter is never… or at worst, when the Summary is posted. "Banters run for roughly a month, and the idea is that a conversation develops with the later entries having the opportunity to reply to earlier ones. So there is very much a point to posting a week later than everyone else. I'd like to move away from the misconception everyone needs to reply at the same time and say the same thing." Dint see this at first… but I really like Noobs idea of the Banter Light, or the 'NanoBanter'. Have these between main Banters as a break.. and/or mebbe pop them in during a main banter run. Something related to or very to-the-point of a current Banter, but looking instead for gut reactions and quick, short responses not the usual in-depth stuff. IE: During the "Home" banter you could have asked for a vote, where do you call home in one sentence. During "Public Perception" you could have asked for one paragraph defining just one thing that was seen as the #1 worst thing in Eve (or the converse) as regards public perception. Later response. What about a Blog Bandit version? We all meet up and go on a roam. I am sure there will be no shortage of people willing to hunt us down. Then we all blog that and see what what the consensus is?